Visitors to a new church often have questions about what the experience of worship will be like. What should I wear? What will the music be like? Are there certain things I should and should not do? Fundamentally, the most important thing to us is that you attend! A new worship experience always takes some getting used to, but welcoming newcomers and making them comfortable is a high priority for us at Trinity. Here are a few questions we sometimes hear – or asked ourselves when we were first looking for a church home. Most members will arrive within five to fifteen minutes of the start of the service, but some may arrive earlier for peaceful contemplation prior to the start of the service. Within ten minutes of the start of the service it is typically customary to sit in quiet thought before the service begins. Some members will choose to kneel in prayer, while others may simply sit. Our address is 124 N. Mulanix, Kirksville, MO (the corner of Harrison and Mulanix.) Parking is in the street, but accessible parking is available diagonally on Harrison Street. We have wheelchair access from the Harrison Street entrance and a lift that can take visitors to all levels of the building. Three accessible bathrooms are available, including on the sanctuary level. 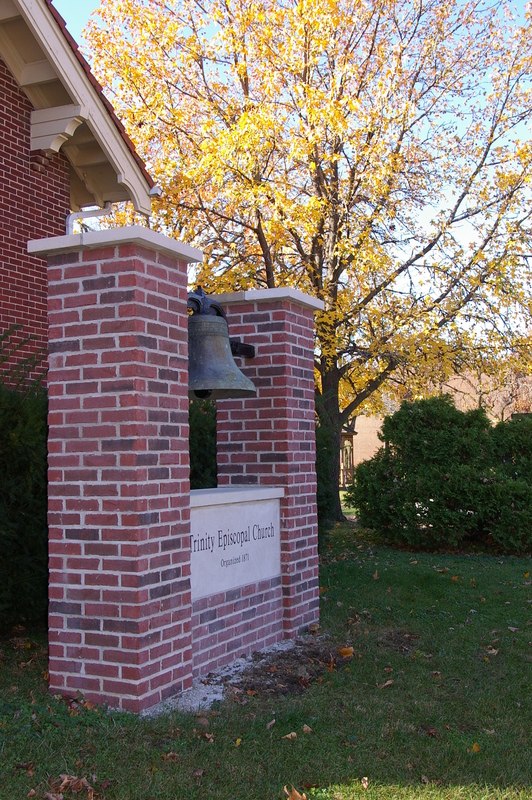 Our two main services during the week are Sunday at 10 a.m. (regular church service with communion, also known as a Eucharistic service–it lasts around one hour and 15 minutes) and Wednesday at 7:30 a.m. (Morning Prayer service, a non-Eucharistic service that lasts around 20-25 minutes.) The sanctuary is upstairs and worship is held there. All baptized persons are welcome to receive the Sacraments. We use “real wine” for Communion. 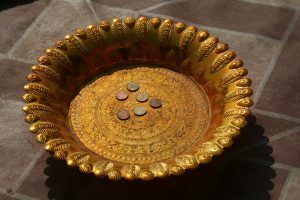 When you receive the bread, you can either eat it immediately and drink from the chalice, or you can hold on to your bread until the chalice comes by and dip the bread in the wine and then eat it (“intinction”). Bread is actually a wafer, and a gluten-free alternative is available for those needing it. If you need gluten-free wafers, we encourage you to come forward first. 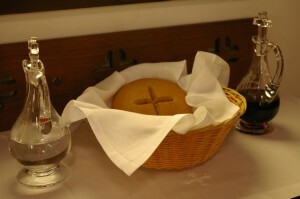 If for personal or health reasons you do not wish to consume wine with alcohol or consume wine in a “common cup” (one shared with everyone), you may request to receive only the bread. Our Canons (the “rules” of the church) say that receiving only the bread is sufficient to fully participate in Communion. If you do not wish to participate in Communion, you may either remain seated or you may go forward for a blessing. If this is the case, the universal “sign” for wishing a blessing but not Communion is to fold your arms across your chest and shoulders in an “X”. Communion is served at ground level to make it accessible to all. You do not need to go up stairs or kneel at an altar (though a small kneeler is available for those who wish to kneel and pray after receiving the sacraments). We have a choir that will give you chills when it sings, a beautiful organ (and great organists! ), and occasional instrumental ensembles. The congregation uses the Episcopal Hymnal during its services, but the choir performs a range of music from classical works to more contemporary pieces. Pieces from other musical traditions, such as Native American, African American, and international are occasionally used as well. 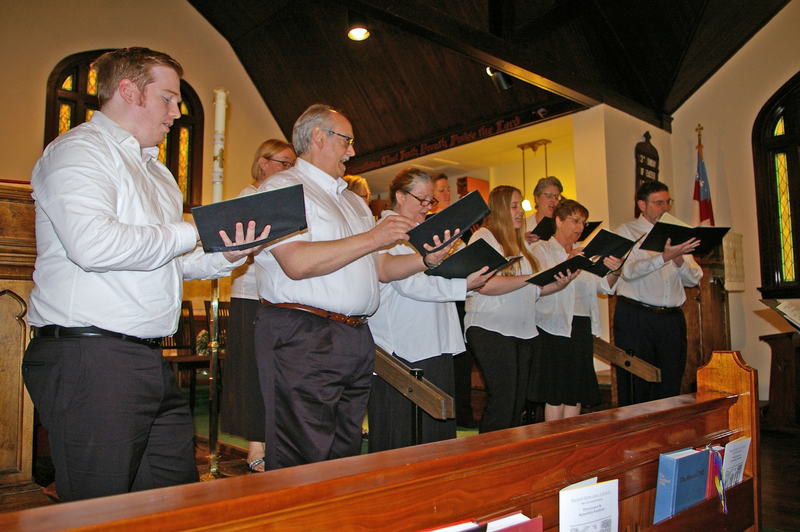 The Psalms are chanted and other short lyrical responses punctuate the service. No. There is no assigned seating. While some of us are creatures of habit, nobody will mind where you sit. They will welcome the opportunity to sit with you and get to know you. Absolutely not. While a general welcome to visitors with an invitation to sign our guest book is always made, you will not be pointed-out as “the new person.” But don’t be surprised if people come up to you after the service to shake your hand and say, “Hello.” While we encourage visitors to sign our guest book and let us know if they would like to be added to our e-mail or mailing list, nobody will bother you at home unless you request a visit. We respect your choice to involve yourself in our ministry in your own way, and at your own pace. The first person you will probably meet on any given Sunday will be a greeter. On most Sundays, this person will be there handing out service bulletins. If your first time attending Trinity is one of our special evening services or Wednesday morning prayer, the service bulletins are on a small table at the back of the main section of pews. Chances are, the person sitting next to you will say “hi.” In short, we will notice you–but not inappropriately so. We will NOT try to convert you, pressure you, or show up on your doorstep with food and Bible tracts, or show up and try to sell you a whole life insurance policy! Our follow-up is only to thank you and give you the opportunity to ask any questions about us, our worship, or our beliefs, if you are so inclined. 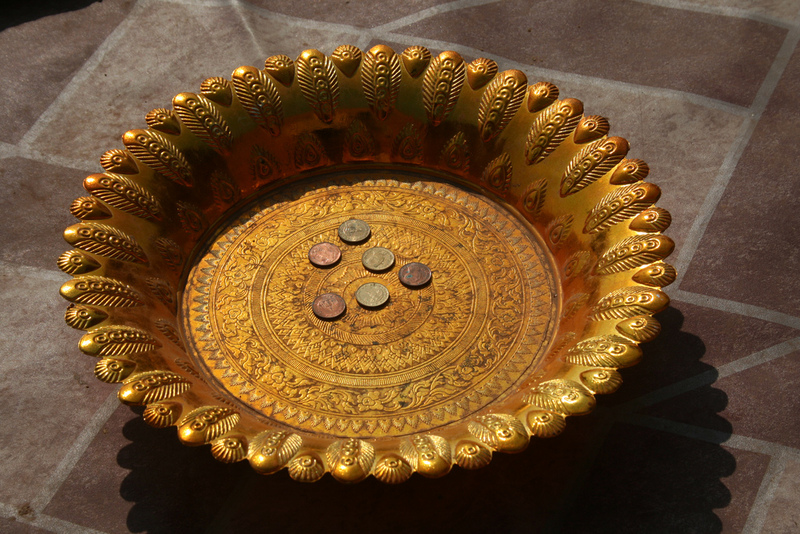 We do “pass the plate” on Sundays during the offertory, but guests are under no obligation to contribute. Our members make pledges each year to the church and our budget is created around our anticipated pledge revenue. Are There Gatherings After the Service? Yes! A coffee hour follows our services every Sunday. The food is quite good, if we do say so ourselves! Episcopal churches are liturgical in nature. Typically our services follow a prescribed order and certain rituals are repeated in more or less the same form throughout seasons of the church year. Scriptures are read based on a cyclical liturgical calendar. 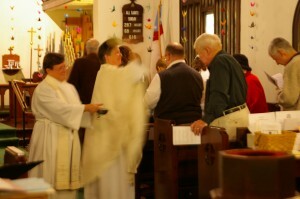 At the appointed time during the Eucharist, those wishing to participate are invited forward. People line-up in the center aisle and come forward to where the Priest and the Chalice Bearer are standing. The Priest will offer you a piece of bread. Then a server will offer you the communion chalice with wine. Some people will choose to dip the bread in the wine before placing it in their mouth. Others will first consume the bread and then drink directly from the cup when offered. The brim of the cup is wiped after use by each person who drinks from it. If you wish to decline receiving the communion elements, you may cross your arms to receive a blessing from the Priest. Wine is used in our services. Do I Sit, Kneel, or Stand? The bulletin will instruct the congregation when to stand or kneel. In most instances where kneeling is suggested, standing is an acceptable alternative. I Have Kids. Sometimes They Can Be a Little Rambunctious. Is That Okay? We welcome families of all makes and models at Trinity. We have a nursery downstairs for infants and smaller children. Part of learning to worship as a family is teaching children “the art of attending church,” and we realize there is always going to be some noise and confusion here and there. If you need to calm a restless child, you are free to take the children downstairs, but children should not be in the undercroft unattended. Our members feel that including children in worship is an important part of their spiritual formation. For more information see our page on the Nursery and Youth. Will There Be Anyone There Sort of Like Me? It’s very likely, if you consider we are all God’s children! Granted, the demographics of Trinity are much like the demographics of Kirksville, MO–mostly Caucasian, mostly Midwestern, and with a higher than usual percentage of people associated with one of the three institutions of higher learning in town, particularly Truman State University. But we have some interesting variety all the same. We have town and gown, we have young and old, we have married and single, we have people new to the community, and we have 5th generation northeast Missourians. We are also an Oasis congregation in the Diocese of Missouri, which means we are committed to being a welcoming, affirming parish to the gay/lesbian/bisexual/transgender community – and we have a fair number of members who call themselves part of that community, including people in leadership positions. The Episcopal Church is known throughout the country as the “church with the red door”–a symbol of sanctuary–and the church with the signs that say, “The Episcopal Church Welcomes You.” We aim to live up to those two icons! I’m Not an Episcopalian. I’m Not Even Sure What an Episcopalian IS. What Do You Believe? I’ve Been to an Episcopal Church Before, and All the Books and the Bulletins are Sort of Confusing. How Do I Follow Along in Worship? Worshiping at an Episcopal church can seem rather daunting, because most people find themselves juggling three things–the bulletin, the red Book of Common Prayer, and the blue Hymnal–when the vast majority of our worshipers have no more than two hands! We recently re-designed our church worship bulletins to help with this confusion. Most of our liturgy for our Sunday worship service will be in the bulletin, with occasional trips to the blue Hymnal for singing, and the red Book of Common Prayer for liturgical things omitted from the bulletin. Where BCP # appears, this directs you to a passage in the Red Book of Common Prayer. Hymns on the Hymn board correspond to the blue Hymnal. “Insert” means there is a hymn that appears in a bulletin insert, or a loose sheet stuck in the hymnal. If you see LEVAS # or L# this refers to a supplemental Hymnal, Lift Every Voice and Sing, which is also in the book rail of the pew. Don’t be shy about asking for help, and you might find that someone has already sensed your confusion and wants to help. Some people find themselves wondering when to stand up, sit down, or kneel. A good rule is this: We stand to sing, to sing or recite the Gloria, hear the reading of the Gospel, and to recite the affirming words of our faith such as the Nicene Creed or the Prayers of the People. We kneel or sit (depending on physical condition) for the Confession of Sin. During the Eucharistic Prayer, we stand at the beginning, and after the Sanctus (the part where we recite or sing, “Holy Holy Holy, Lord; God of power and might”) some people choose to kneel and others choose to stand. But don’t worry if it seems confusing. Just watch your neighbors! Again, those sitting next to you will be glad to help, and we won’t feel offended in the least if you need help. What Do Your Parishioners Love About Trinity? The answer to that question is as varied as the personalities who attend Trinity. Some love the music. Some love the “high church” feel of liturgical worship. Some love seeing their friends. Some love the more intellectual aspects of our faith community. 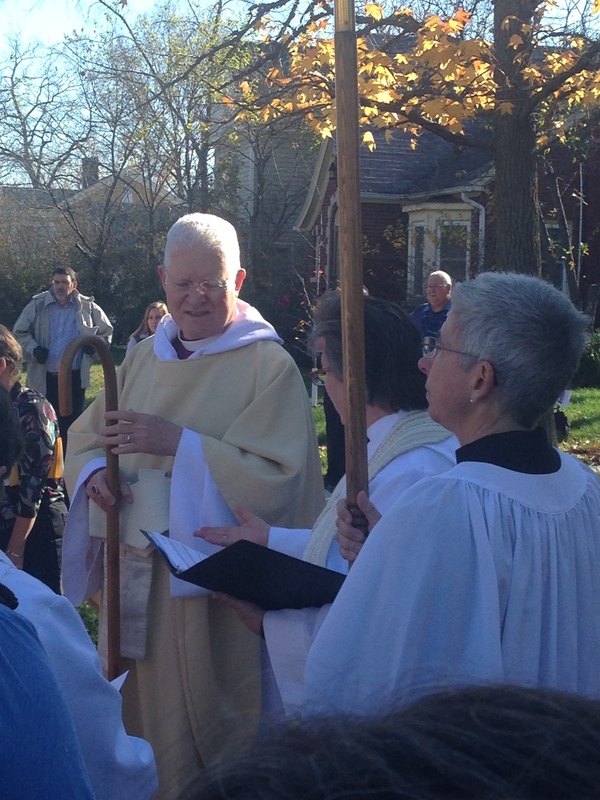 Some love to serve as lector, reader of Prayers of the People, acolyte, or coffee hour person. Some love the quiet contemplative spaces in worship. Some love to take Communion. Some are passionate about the mission work of the church. Some love it all! We hope that in your interactions with us, you will find out what these people love about Trinity over coffee hour.